Successfully Added Solar + Dynamo Survival Radio - Temperature Gauge + Flashlight to your Shopping Cart. Solar and hand cranked dynamo powered mobile survival station with 5 different and incredibly useful emergency situation functions. 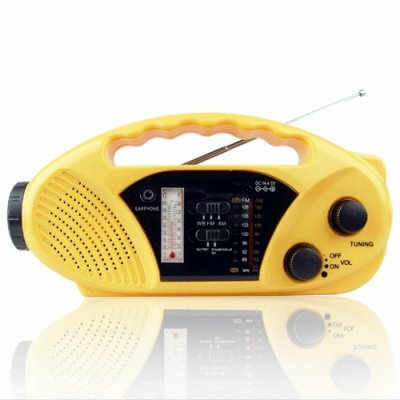 The unit acts as a FM/AM radio, a high powered flashlight, a flashing red LED beacon, a mobile phone recharging station, and even as a thermometer with a Fahrenheit and Celsius gauge. Having three different means of recharging, including completely renewable solar power and hand cranking power, this is a emergency device that will work whenever and wherever you need it. Source this great Chinavasion gadget for your own store, or buy a single sample for yourself for those unpredictable emergency situations..